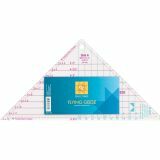 Easy Star & Geese Ruler - WRIGHTS-Easy Star and Geese Quilting Rulers. Easy to use ruler for cutting triangles for flying geese units. Make nine geese sizes (2x4 to 6x12). Make blocks from 4 to 24. Ruler features 2 color printing for use on light and dark fabrics. Use flying geese for many wonderful quilt designs. Package includes Easy Star and Geese Ruler, step by step instructions and a quilt pattern. Size: 9 1/4x9 1/4x13.